In June, ETFO made history when we moved into our new home in downtown Toronto. The brand new four-story building will serve as an outstanding model for sustainable, efficient construction in the 21st century. 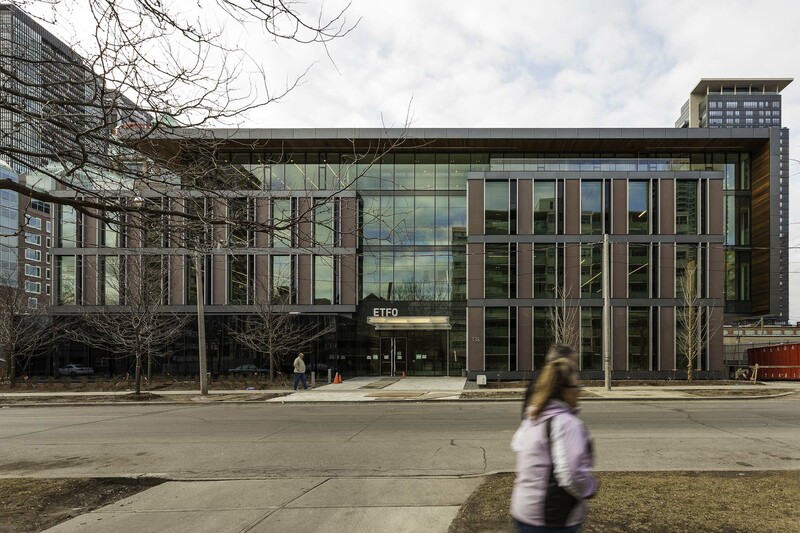 The ETFO office is the first new building in the city that meets the highest environmental standards possible as a certified LEED Platinum structure. LEED (Leadership in Energy and Environmental Design) sets international standards for green buildings worldwide. As Canada’s largest teacher federation, ETFO takes a leadership role in everything it does and its new home is no exception. The building was designed by architects Kuwabara Payne McKenna Blumberg (KPMB), whose portfolio includes The Canadian Museum of Nature, TIFF Bell Lightbox, and the Royal Conservatory’s Koerner Hall. At first glance, KPMB has married top environmental standards with a neighbourhood-friendly, welcoming place. Glass, open spaces with natural light, a green roof system, and a design built around existing trees that also respects the privacy of neighbouring buildings are both innovative and thoughtful. It’s what you don’t see that puts this structure at the top of the environmental class. Rainwater is captured for landscape irrigation and toilet flushing. The majority of heating and cooling comes from geothermal systems located deep underneath the building. Daylight motion sensors adjust the level of lighting needed to supplement natural light which permeates the building’s core through the four-story central atrium. As well, fully automated exterior solar shades reduce glare and solar heat gain to reduce energy consumption and increase office comfort. These and many other features are designed to allow for a workplace that heats, cools, and provides fresh air at a fraction of the usual costs. For ETFO members, staff, and visitors, there are rooms large enough to accommodate meetings and conferences. One hundred percent fresh air circulation, and windows that can be automatically controlled to minimize condensation, all contribute to a healthier environment. While the building’s location reflects the importance and vital role that ETFO’s 76,000 members hold in Ontario, its emergence as the city’s top new LEED Platinum structure will set the pace for all other buildings constructed in the province.